We specialize in all types of high rise window cleaning, especially large contracts and multi-story complexes. Whether the cleaning needs to be done by means of a Building Maintenance Unit (BMU) or by Rope Access, we have the qualified staff to do the work. 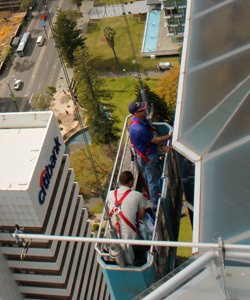 We currently maintain a large number of Properties across Perth that require our specialized high rise window cleaning Perth team. We cover Perth for window cleaning. Blue Sky Window Cleaning is compliant with National Health and Safety legislation. We have implemented safety management policy according to this legislation. In accordance with Work Safe regulations, a written SHWMS document is undertaken before the commencement of all work. Blue Sky Window Cleaning has years of experience and expertise in high rise window cleaning.